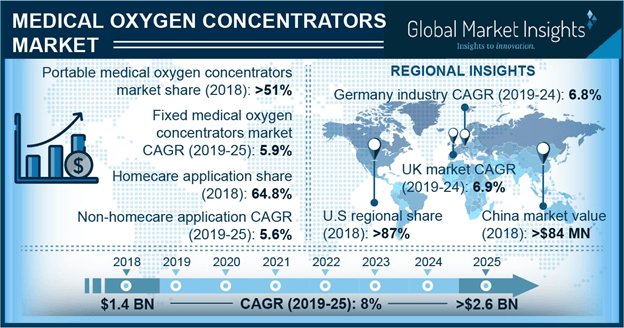 Medical Oxygen Concentrators Market size is set to exceed USD 2.6 billion by 2025; according to a new research report by Global Market Insights. Surging number of cigarette smokers coupled with increasing elderly population base prone to chronic obstructive pulmonary disease (COPD) will be the major factors driving medical oxygen concentrators market growth. Smoking and tobacco consumption significantly increases risk of acquiring COPD and escalates the probability by 50%. WHO estimates that there will be about a billion fatalities due to COPD in the coming years. Thus, rising incidence of COPD coupled with growing risk factors will surge the demand for medical oxygen concentrators over the coming years. Growing geriatric population base that is susceptible to chronic respiratory diseases such as COPD and asthma will stimulate global medical oxygen concentrators industry growth. Increasing healthcare expenditure coupled with surging adoption rate of unhealthy food intake and lack of exercise are the primary factors that will highly impact the market over the forecast timeframe. Government initiatives to control disorders and diseases associated with respiratory system will boost the market growth. For instance, the ‘Bill and Melinda Gates Foundation’ works in association with several country’s government for addressing domestic respiratory system complications in the U.S. The foundation functions to provide oxygen supplying devices in regions having high mortality rates owing to respiratory issue that will considerably spur medical oxygen concentrators industry growth in coming years. Portable medical oxygen concentrators market accounted for over 51% of industry revenue share in 2018. High market share can be attributed to several advancements that include compact size, increased efficiency, battery life and affordable price. Moreover, rising demand for portable oxygen concentrators and technological advances are forecasted to impel portable medical oxygen concentrators business growth. Home care medical oxygen concentrators segment held 64.8% revenue share in 2018 and will witness similar trend in foreseeable future. High revenue share is attributable to associated advantages offered at by home care medical oxygen concentrators such as better cost-effectivity and suitable care provided in line with personal needs. Thus, increasing customer preference for home care medical oxygen concentrators owing to its benefits will drive the home care medical oxygen concentrators segmental growth in the foreseeable years. Pulse flow medical oxygen concentrators segment will witness 9.0% CAGR during the forecast timeframe owing to advances in pulse flow technology. Rising investment for R&D activities by companies to implement advanced technology in products will aid in rapid adoption of the pulse flow technological products. Additionally, associated advantages provided by pulse flow such as, automatic adjusting settings, and compact size of the pulse dose oxygen concentrators by lighter weight technology should boost segmental growth in the upcoming timeframe. UK market will witness 6.9% CAGR throughout the projected timeframe. High growth is attributed to rising elderly population prone to chronic diseases and growing number of cigarette smokers. Moreover, lack of exercise and rising consumption of unhealthy food intake are some factors that will increase chronic conditions risk thus, driving the demand for medical oxygen concentrators. China market was valued over USD 84.0 million in 2018 and is estimated to witness significant growth over the coming years. Increasing air pollution and increasing prevalence of asthma and COPD will significantly contribute to Chinese market growth. Additionally, urban areas of China suffers from high air pollution that increases the risk of acquiring COPD. Such factors will thereby increase the demand for medical oxygen concentrators in the upcoming years. Some of the major industry players functional in global medical oxygen concentrators market are Inogen, Invacare, Chart Industries (AirSep), Philips Healthcare and NIDEK Medical Products, among other industry players. These business players are emphasizing on acquisitions and launch of novel products to earn profit in medical oxygen concentrators industry. For instance, in May 2016, O2 Concepts launched Dynamic Network Analysis platform that links all the oxygen concentrators through Verizon network.